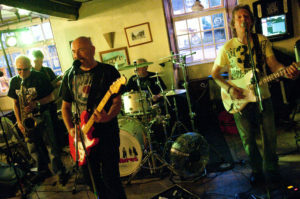 Tres Hombres perform at The Cross Inn. Caldicot. Andy Berry, lead guitar and vocals, Rob Bennett, bass guitar, Graeme ” Lennie ” Jones, drums, John Morris, lead guitar and vocals, and Paul Powell, sax and vocals. All Moral Rights Reserved including the right to be identified as the creator of this copyright protected image.